This is an early song, published in 1681 in Playford’s third book of Choice Ayres and Songs. The poet, falling in love with a lady, was far too easy a target for her and she has now rejected him, to his great hurt. 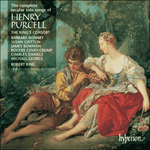 Purcell’s setting is made all the more attractive by its unpredictably individual melodic line. I may die, and ne’er see her more.